A Borderline Mom: Radio Rebel Available Now!!! Debby Ryan stars as Tara Adams, a shy seventeen year old who secretly is a podcast DJ called "Radio Rebel." She encourages her classmates (that don't know who she actually is) to be themselves. This angers the principal who vows to find and punish this outspoken radio personality. Family Time Factor: I'm thinking kids 6-16 would probably like it. 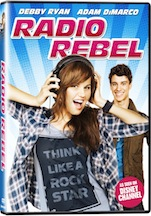 Radio Rebel is currently available on DVD!! !